Stamford Talk: Eat, Think, Drive, Blog! 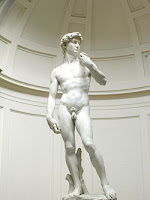 : Do We Care About the Naked Gold David? I don't. But I mean, does Stamford as a whole care that an art store at the Bull's Head intersection displays a life-sized, gold-painted replica of Michelangelo's masterpiece? I drive by there regularly and either don't notice it, or I think, without much interest at all, wow, that's weird. A naked, gold man, right beside the road. I can't figure out who would care. Since it doesn't faze me, I assumed no one else cared either. I guess I forgot there's not one type of person in Stamford. We're young, we're old, we're rich, we're poor, we're neither, we own, we rent, we're Italian, we're Haitian, we have kids, don't have kids, etc. In all this mix, someone is probably really annoyed by that statue. You might think, if 888 Wash had to take down the scary paper mache bear, should the naked guy go too? Bear = scary. Naked gold man = funny. 888 Wash = government building. Art/framing store = private. I suppose the sidewalk that David stands on is probably public, so I'll change my "no" to "maybe, I don't really care." I'll have to swing by one day to see what the owner thinks. I should gather some data. Maybe I could stand beside the statue with a sign that says, "Honk if you think this statue is funny." I could have a friend stand with me holding a sign that says, "Scream out your window if you find this statue offensive." That would make for a fun day. I'm changing my "maybe, I don't really care," to "leave it up, it gives this town some wackiness." I think the statue is quite tacky. It is tacky, isn't it? And, he's just UGLY. I LIKE the gold David! I have always meant to have my picture taken with him, maybe doing something cheeky like patting his bum or shielding his man parts with a newspaper. Photo ops with the gold art store David should become one of those top ten cheap thrills that every visitor to Stamford MUST do. Is he not a seasonal feature? That just adds to his specialness, in my opinion.